Be the first to share your favorite memory, photo or story of Ray "Gysic". This memorial page is dedicated for family, friends and future generations to celebrate the life of their loved one. 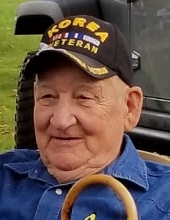 Ray "Gysic" Edward Moore, age 86, of Spraggs, PA, passed away Tuesday, February 19, 2019 at Waynesburg Health & Rehabilitation Center. Born April 8, 1932, in Brave, PA, he was the son of the late Perry and Clara Ethel (Whitehill) Moore. Ray was a lifetime resident of Wayne Twp. He was a member of Pursley Baptist Church. Ray served in the United States Army between 1952–1954 during the Korean War. He was a former employee of Penn Line and Don George Roofing. Ray worked for Laborer’s International Union Local 379, Morgantown, WV, for 33 years until he retired in 1994. He was a former member of the Waynesburg VFW Post # 4793. He is survived by three children, Melinda (Jeff) Jeffries, of Jefferson, PA, David (Laura) Moore, of East View, PA and Mike (Debbie) Moore, of Clinton, NC; 12 grandchildren; 22 great-grandchildren; one sister, Roxanna Carpenter, of Waynesburg, PA. In addition to his wife, Mary Jean Moore, who passed away November 8, 2000, he was preceded in death by one son, Randy Ray Moore; one grandson, Bill Patterson; two great-grandchildren, Addison Jeffries and Riley Wise; four brothers, Robert I. Moore, who was killed in WWII, Perry Moore, Jr., Thomas F. Moore and Herschel E. Moore; one sister, Geraldine Shultz. Friends will be received on Thursday, February 21, 2019 from 2-4 p.m. and 6-8 p.m. at Kesterson-Rush Funeral Home, LLC. 3275 W. Roy Furman Hwy. Rogersville, PA 15359. Telephone: 724-499-5181. A funeral service will be held on Friday, February 22, 2019 at 11:00 a.m. at the funeral home with Pastor Jim Carpenter, officiating. Burial will follow at Old Phillips Cemetery, Spraggs, PA. with full military honors conducted by the U.S. Army and also accompanied by the Waynesburg American Legion Post #330 and Waynesburg VFW Post # 4793. In lieu of flowers, memorial contribution may be made to Kesterson-Rush Funeral Home, LLC. To send flowers or a remembrance gift to the family of Ray "Gysic" Edward Moore, please visit our Tribute Store. "Email Address" would like to share the life celebration of Ray "Gysic" Edward Moore. Click on the "link" to go to share a favorite memory or leave a condolence message for the family.